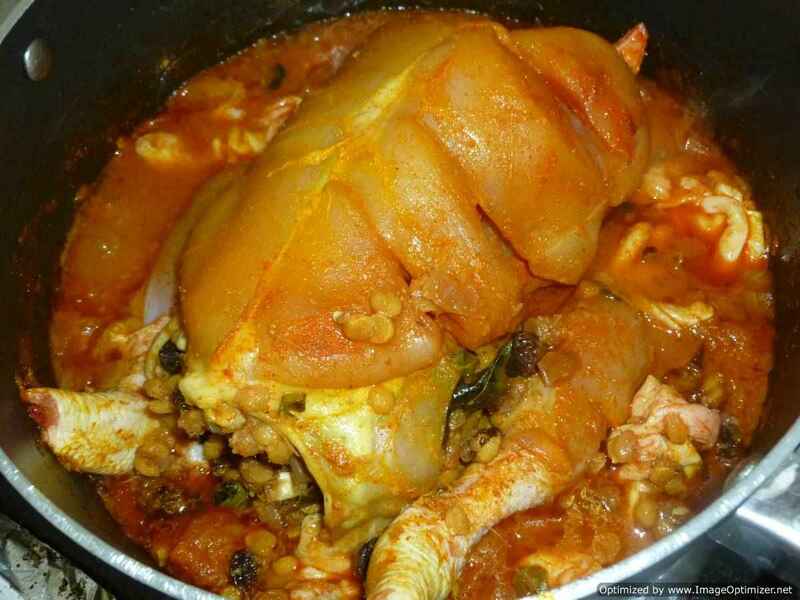 Stuffed full chicken curry is cooked on special occasions. Every home could have their own recipe. 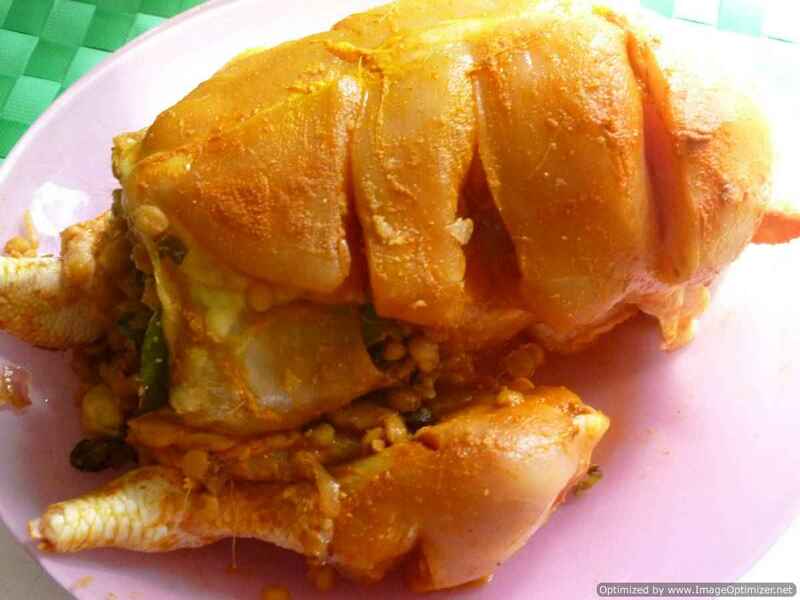 Kozhi nirachathu (stuffed chicken) is a kerelan dish in which a whole chicken is stuffed and cooked slowly. 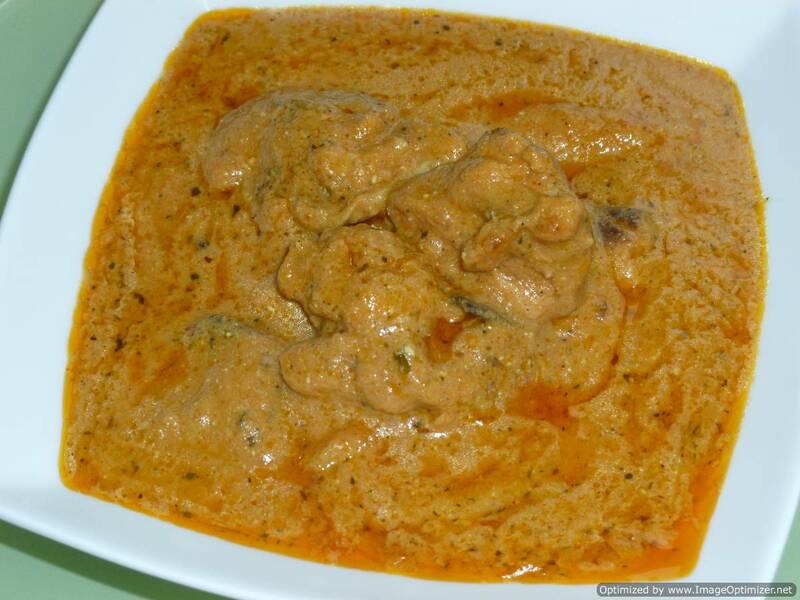 It is like Murg Musallam but the spices that are used in this are different. I got this recipe from one of the TV shows called Coconut coast. It is from Kerala. I liked the recipe as the ingredients are simple and the stuffing goes well with the curry. 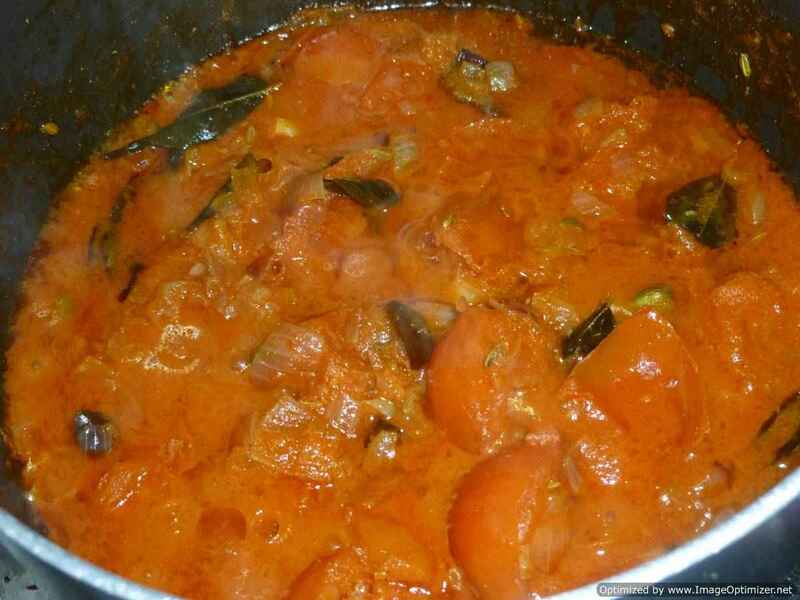 I made only slight changes in the spices and the quantity of ingredients used, but not much. The spiciness and sweetness together goes well. Sweetness is from kish-mish (raisins) and cashew nuts. I have stuffed one boiled egg in the chicken. You can stuff more eggs depending on the size of the chicken. 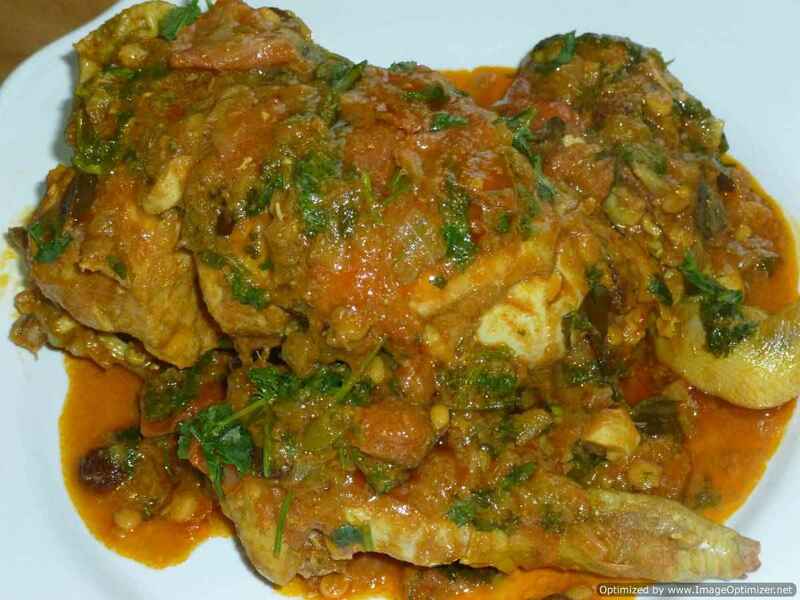 The stuffed full chicken curry includes simple spices which we use in our daily cooking. The process may be long but gives you tasty results. You can prepare this recipe for parties (cutting to pieces may be difficult). You can use almond (badam) also. 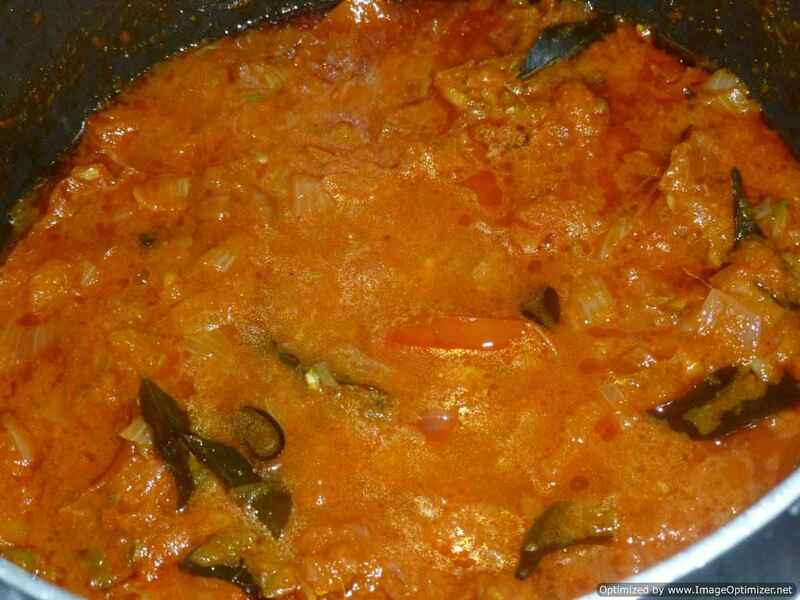 This curry can be eaten with plain rice pulav, parotta, idli or dosa. Marinate the chicken and keep it aside. 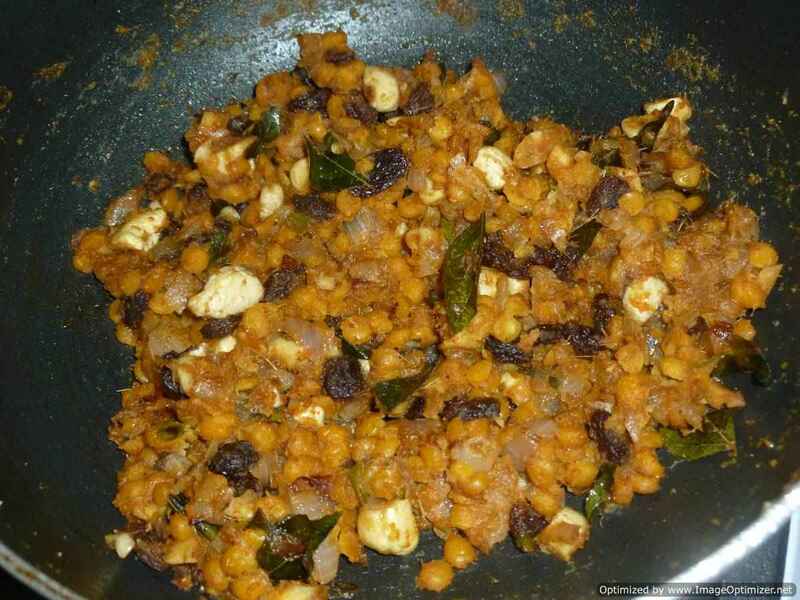 Boil the chana dal and keep it aside. 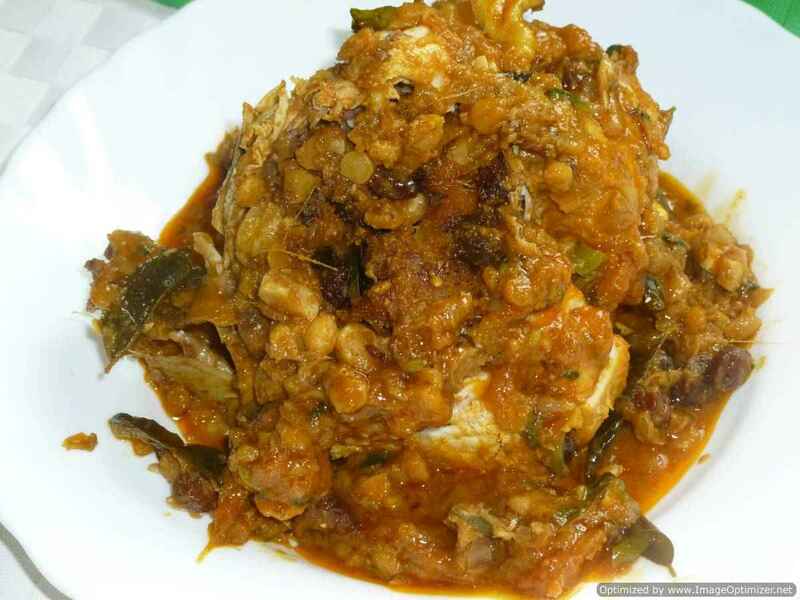 Take a vessel or kadai. Add oil. 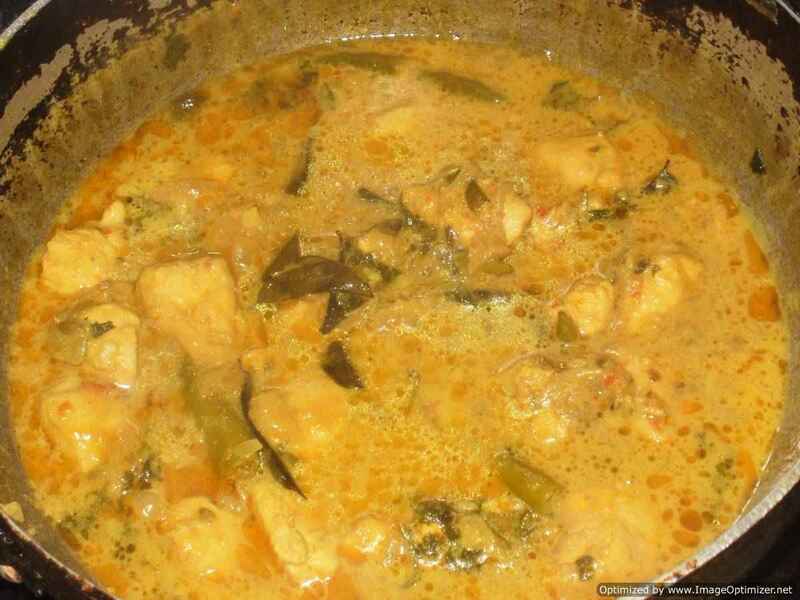 When it gets warm add onions, curry leaves, green chillies and fry until light brown in colour. 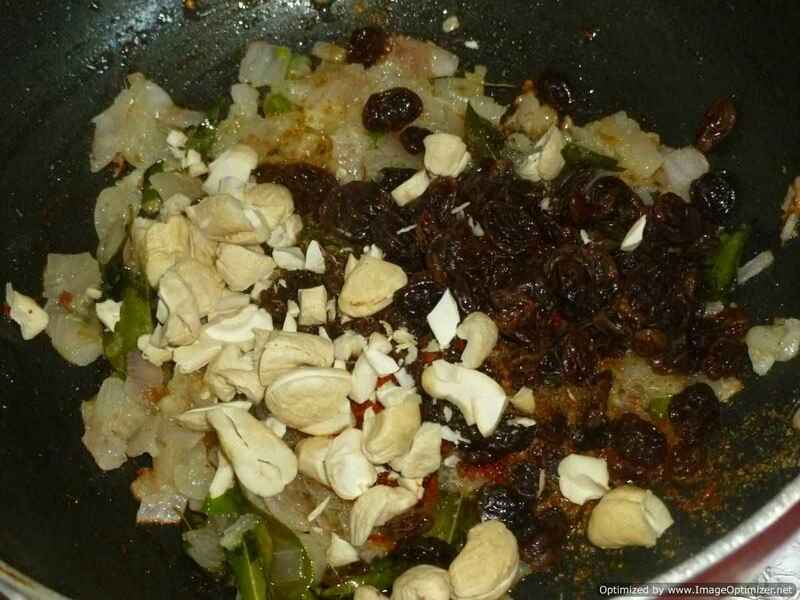 When the onions are fried well, add kish-mish, cashew nuts and all the spices. Mix well. You can add chopped or whole cashew nuts. You can add a little water (30ml or more) to cook the spices. Cook until the spices are cooked well and water is absorbed. 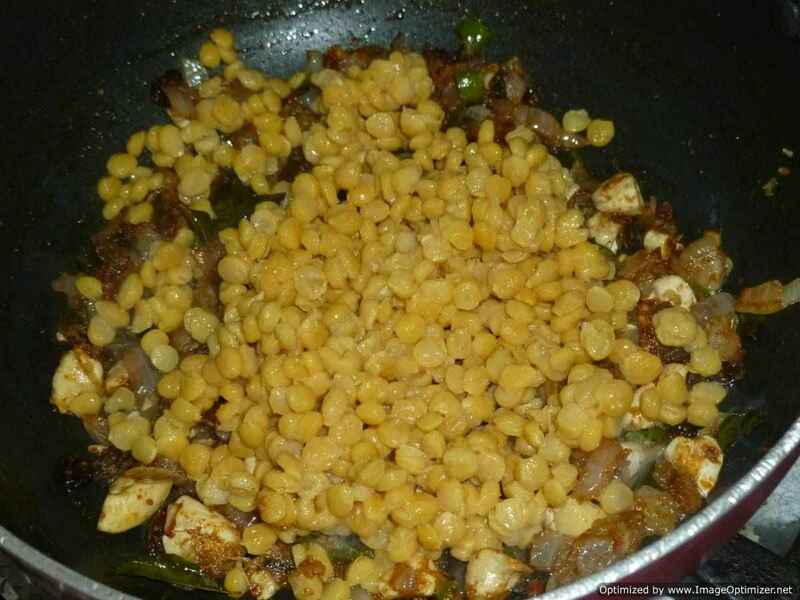 Add boiled chana dal (should not be mashed), lemon juice and salt. Stir and mix well until all the ingredients are mixed together. The stuffing should be dry and not watery. Switch off heat when the spices are cooked well. 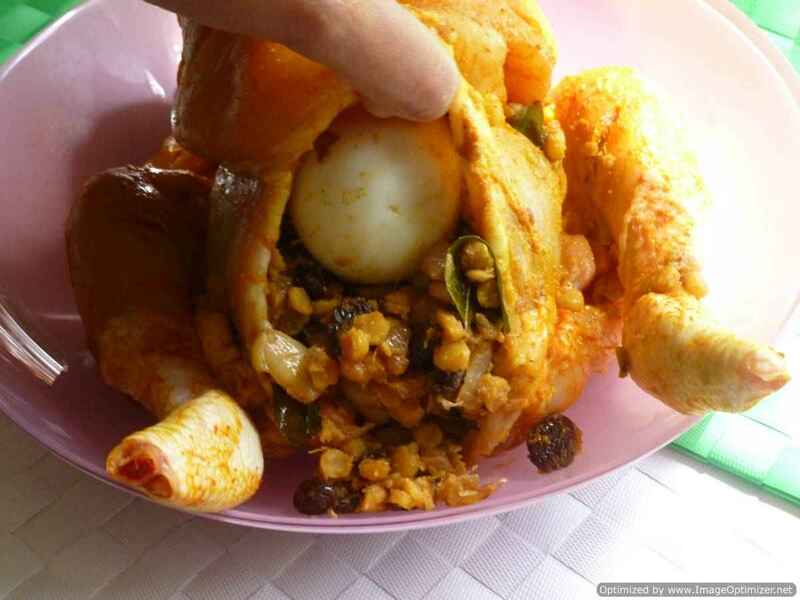 After the stuffing cools, stuff it in the chicken nicely and insert one egg also. Keep it aside. If you want, you can tie the chicken legs and wings. I just left it open. 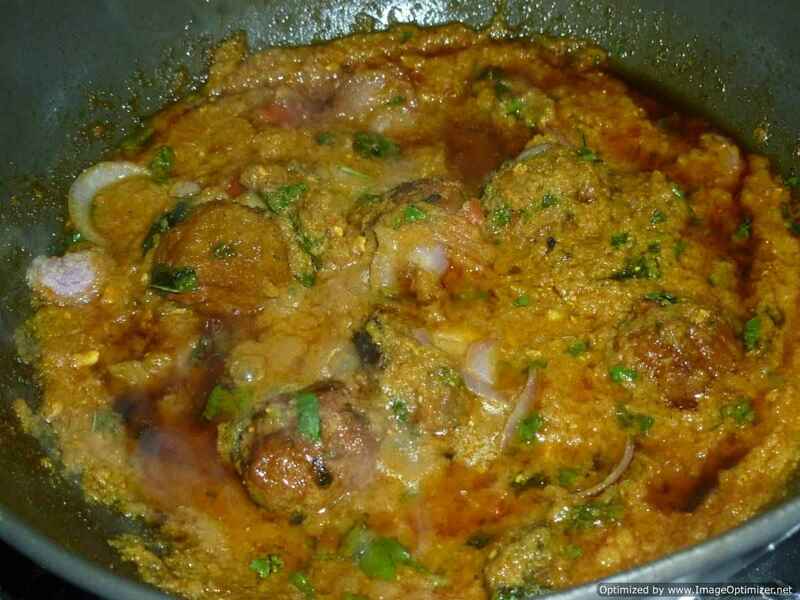 The remaining stuffing can be used in the curry. Take a vessel and add oil. 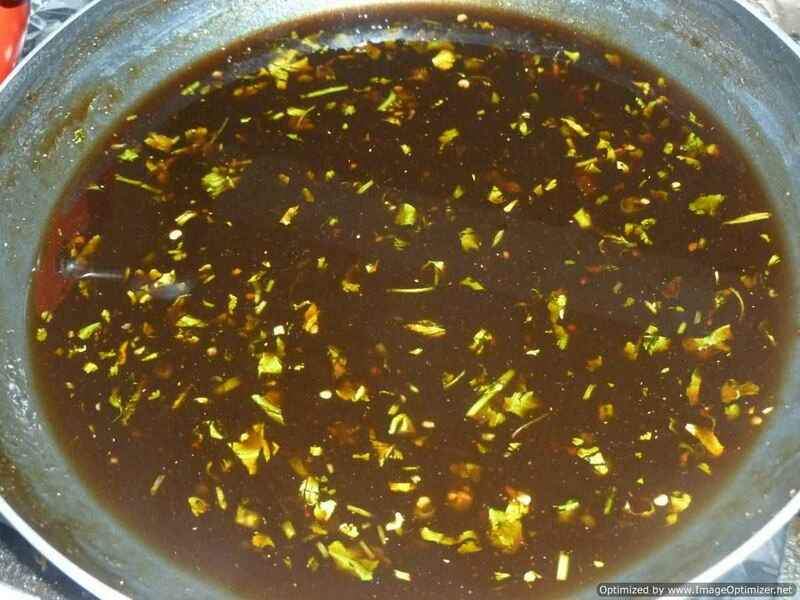 When it gets warm, add onions, curry leaves and fry well until light brown in colour. Now add the whole spices, green chillies, saunf and stir for a minute. 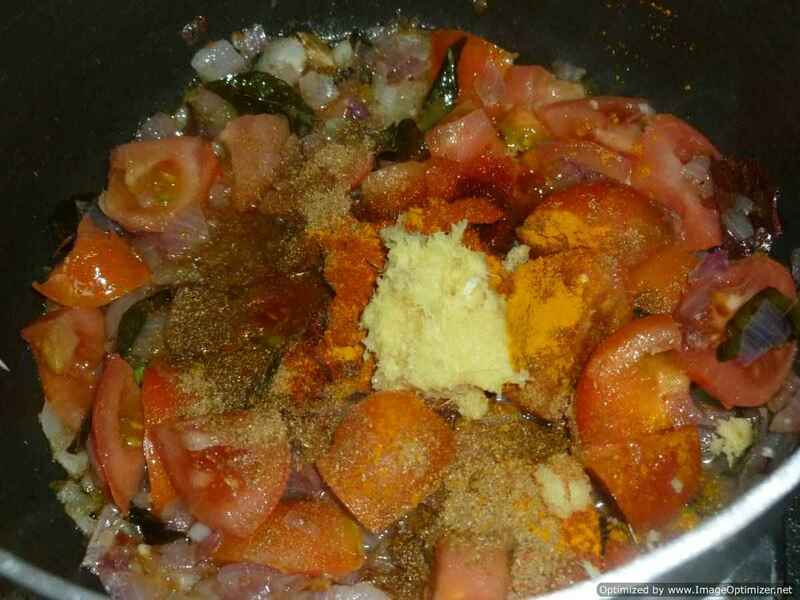 Add ginger and garlic paste, chopped tomatoes, tomato puree and all other spices. Stir for 2 to 3 mins. Now add water and cook for a few minutes with the lid closed or until the tomatoes are mashed and a gravy consistency is formed. It will take about 7 to 10 mins. When you open the lid, you can see that it has come to a gravy consistency. Make sure there is enough liquid to cook the chicken. Now add the remaining stuffing and coriander leaves. Mix well. Place the chicken in the gravy and cook it on medium flame for a few minutes. Close the lid. In between turn the chicken to the other side carefully, pour some gravy on top of the chicken and cook. 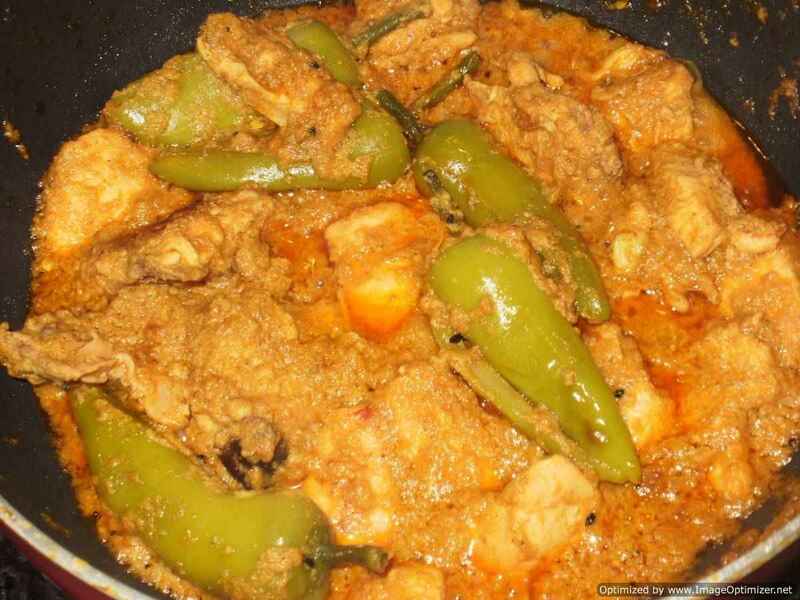 After 15-20 minutes of cooking, you can simmer the flame, close the lid and cook for a further 15 mins or until the chicken is cooked. You can add a little more water if required. 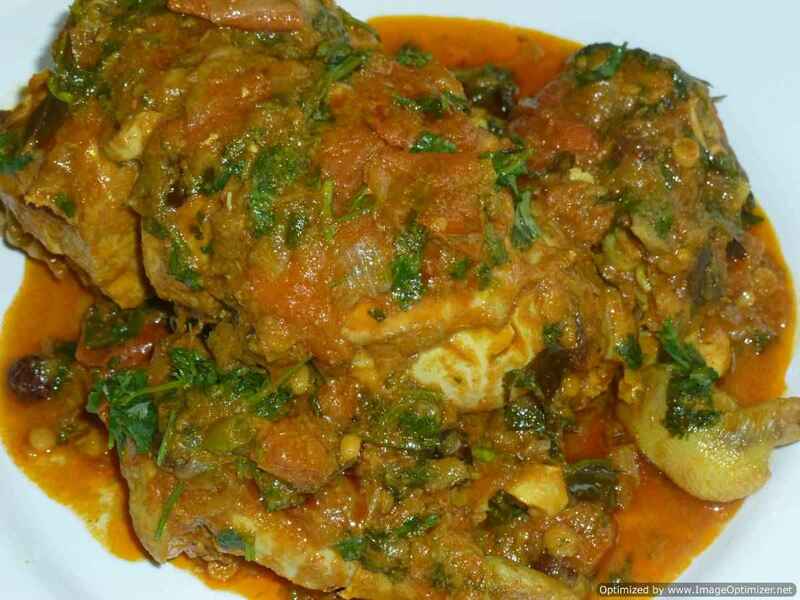 After 15 mins, you can see that the chicken is cooked well and has a good gravy consistency. Add coriander leaves and switch the heat off. 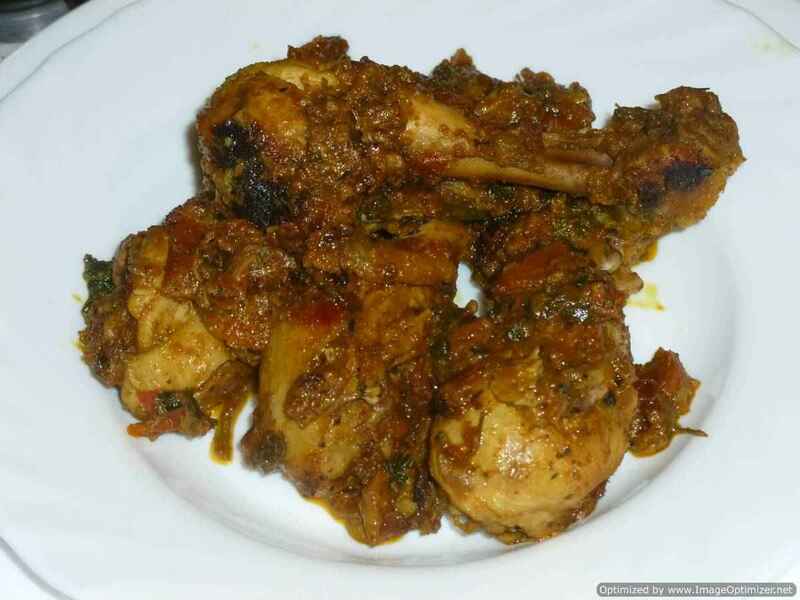 Remove the chicken carefully with 2 big spoons and pour the curry on it. 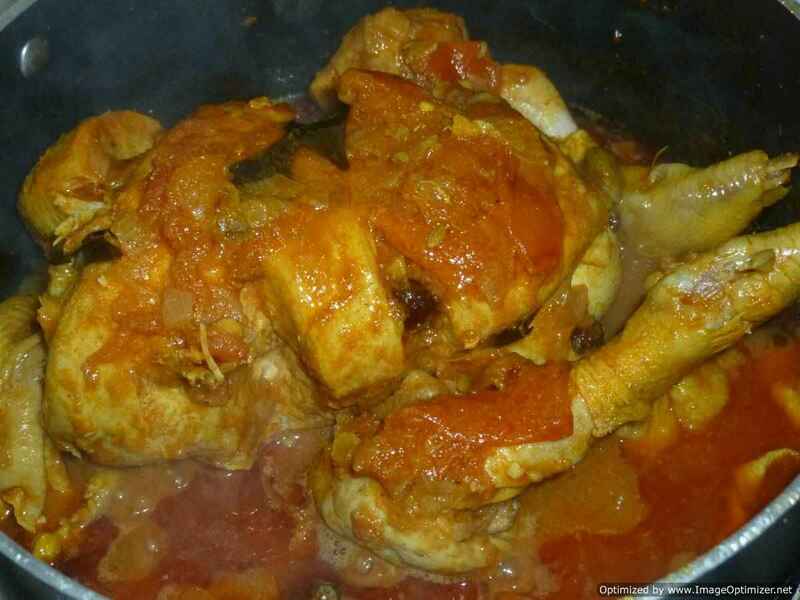 You can see that the chicken has left its fat and the curry is in good reddish colour. Cut the chicken into half and serve. You can see the stuffing inside. 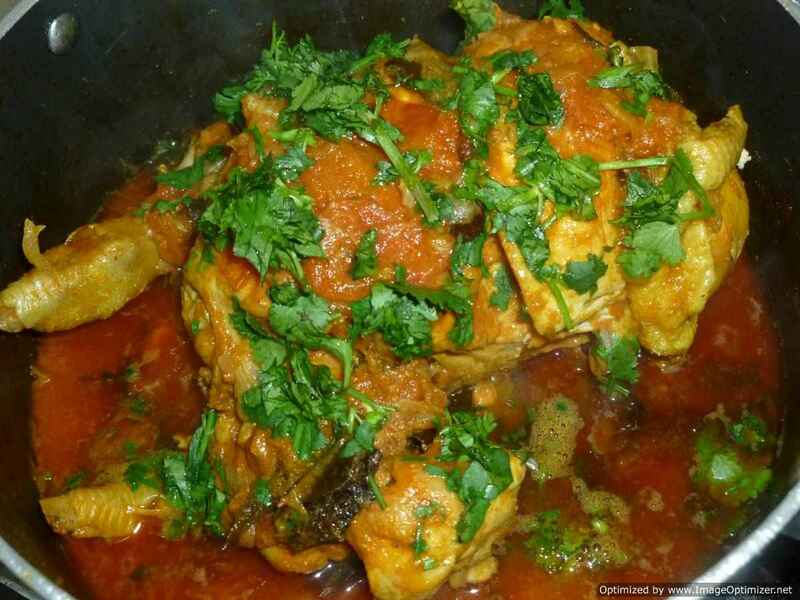 Serve the stuffed full chicken curry with chapathi, parotta or plain rice. 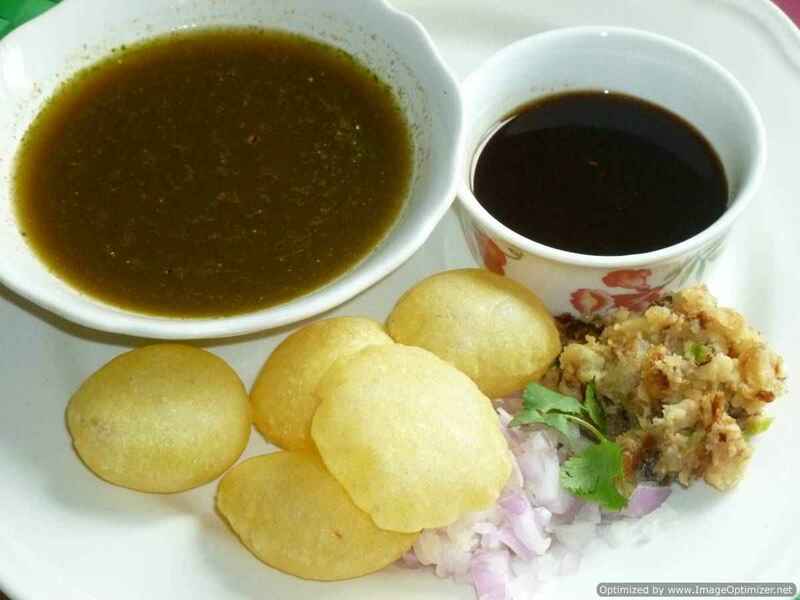 In the stuffing you can use the quantity of kishmish, kaju and other ingredients according to your liking. If the chicken gets brown its okay. I cooked it on medium flame and you can see the brown. If you cook on lower flame it will not get burnt. Keep checking on the water whether there is enough to cook the chicken and for the gravy. When you place the chicken you can simmer at that time itself and cook for about 40 mins or until the chicken is cooked well.